Today we will see a house that has its roots in the vestiges of colonial architecture in Mexico, understood as a style brought by the conquerors of the Spanish Crown to arrive in the Latin lands in the middle of the sixteenth century. ’All buildings, where possible should be uniform to ensure a beautiful city ’, was the order of King Philip II of Spain, providing the orders for the construction of a new world. This family home takes a courtyard as the centre of the building, with covered walkways that surround it and lead into all of the living spaces. A shingled roof also slopes into the courtyard, making this the heart of the structure. This space is definitely a place of absolute relaxation. Earthy colours combined with the warm lighting give a charming atmosphere, with furniture perfectly relaxed for the time and space. 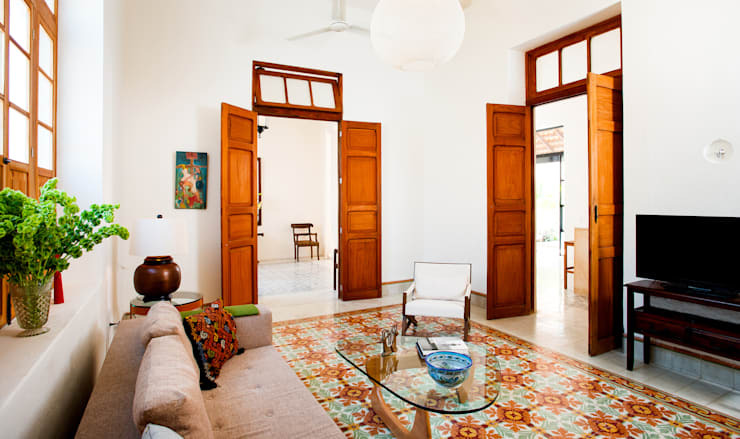 Now let's see how the rooms are in constant relationship to the courtyard through their own doors and windows of colonial architecture. The architects were smart to divide the space of the courtyard where there is a full area and an empty space. You see how the ceiling is transformed, ceasing to be inclined as in the colonial houses were to have a flat roof that serves as a terrace, while the hall ceiling diverts the rainwater. Who would not want to go for a swim after seeing this picture? The aquamarine pool is successful and relaxing for this comfort zone. 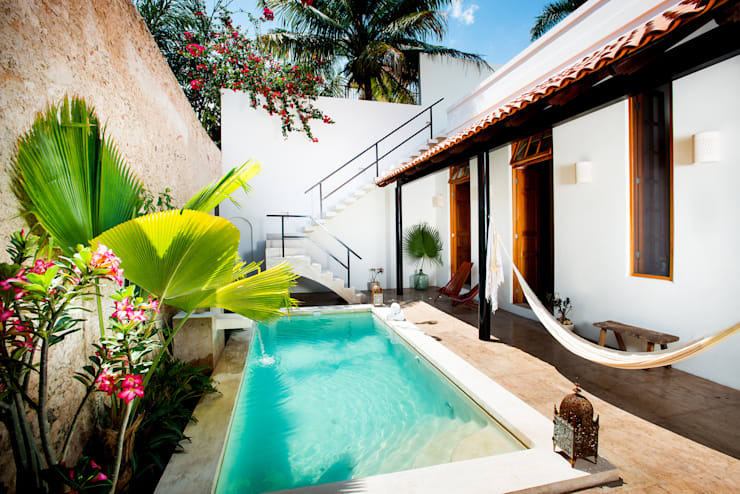 Here we can see how the traditional green and austere courtyard is transformed to make way for the pool as a great modern element of our day. 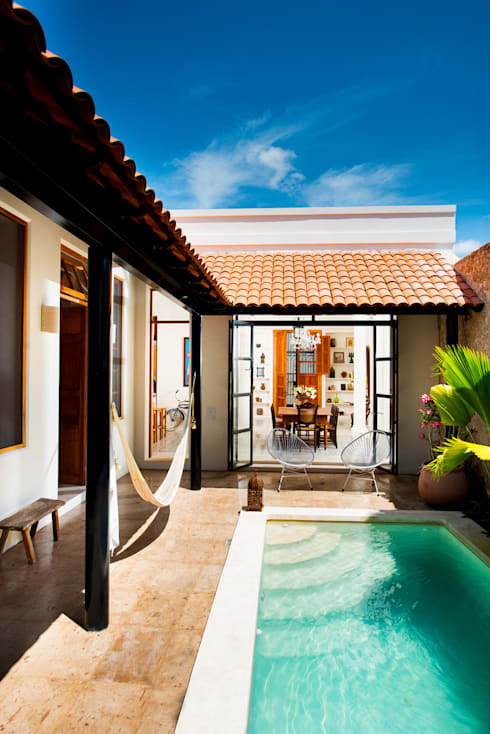 The side aisles surrounding the pool are maintained, and around these we can finds the different rooms of the house. 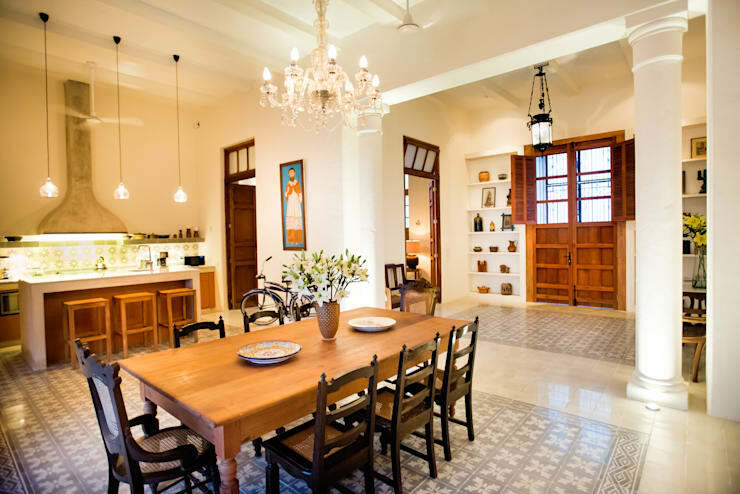 The earthy colours used here blend well with both the environment and the colonial style of the building. Here we can see a delicate, subtle staircase that leads to heaven in a cloud, completely forgetting the heavy wooden features we had in XVI century architecture. 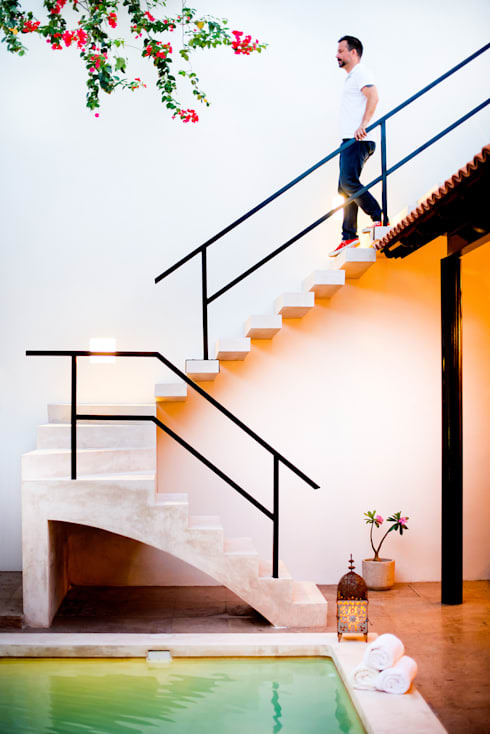 This staircase returns us to the present to make use of a new materials and construction techniques that will allow more light to flow. The rungs anchored in the wall without any support underneath and the super-thin aluminium railing create a weightless and elegant ensemble. A beautiful design coexists in perfect harmony with everything around it. This is a beautiful space with high altitude making it more comfortable and pleasant especially in combination with a great lighting scheme, which is enhanced at night with hanging lamps of two different styles. Wood is the preferred material in different forms and tones, but this versatile material gives personality to the house by demarcating the different spaces by means of different patters and styles. The front door is the main access to the house, which is then presented with a small hall that opens onto the dining room and maintains a full account of the patio. Let's see what's behind those two doors on the left! And now the family room of the house that is closely linked to the foyer, kitchen and dining room through the two doors that we see in the background, having an irregular floor that connects the spaces between them and allows for a slow and gradual approach. Again, the floor tiles are the protagonists of the space, giving it personality and contrasting with the white walls and the completely contemporary furnishings. 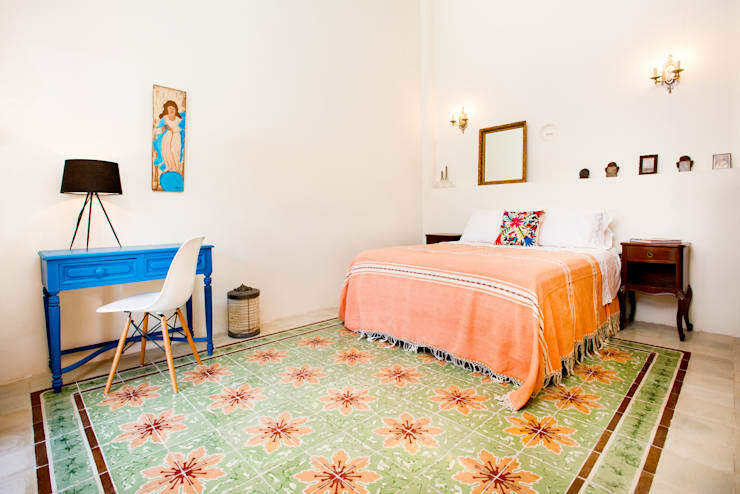 The simple but cheerful bedroom reiterates the design found throughout the house, where the tiles are the protagonists which governs the tone of the colours used in each room, with white walls ready to receive any element, which in this case includes the bright colours added by the furniture and decoration. 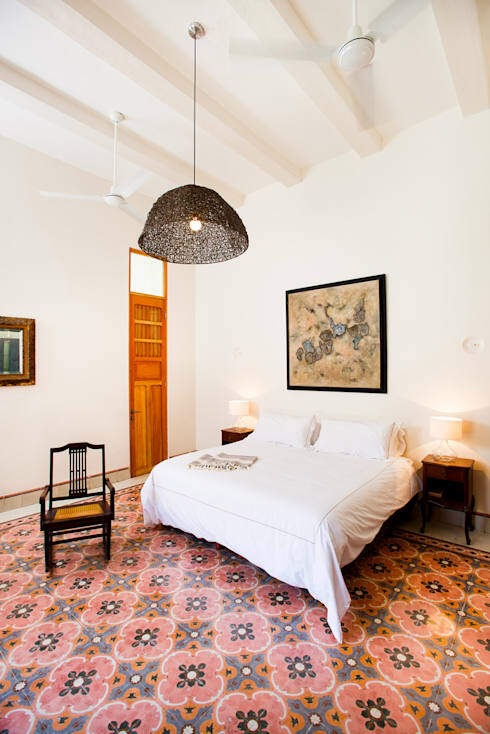 In this bedroom we find another pattern of colourful tiles, and it quickly becomes evident that each individual room has its own pattern and design. 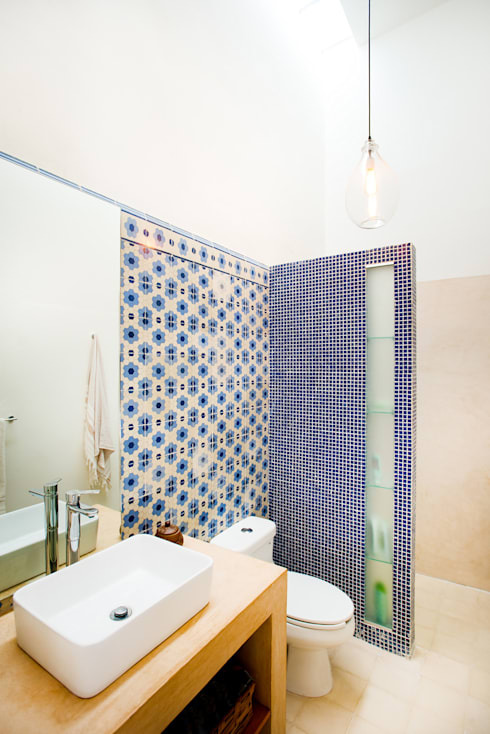 In this manner, the continuity of using tiles in all areas allows for uniformity, while the different designs allow for variety and the individualisation of spaces. These vibrant and interesting hydraulically pressed tiles sure do make for beautiful backgrounds, and it also suits the colonial theme very well. Even just a quick glance into one of the homes bathrooms does not leave us disappointed. 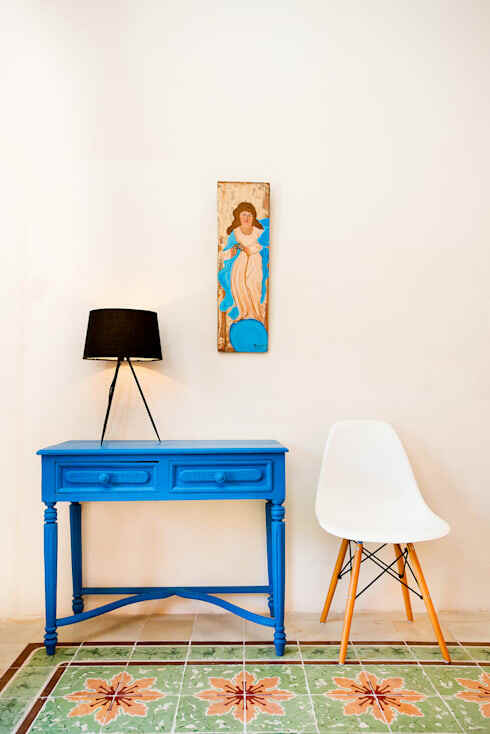 This small space is transformed into a vibrant and colourful living area by the use of the popular tiles, and the blue used as theme here is perfect to signal serenity and relaxation in this space. We say goodbye to this fantastic house with an image that captures, in our opinion, the synthesis of this magical housing that mixes colours, styles and different characters in a single moment, time and space, making them coexist harmoniously. This is a beautiful example of how a classic language converses perfectly with a contemporary style—different worlds and different eras meet. If you enjoyed looking at this home and appreciate projects with a sense of heritage, you might also enjoy this: Home with a splendid colonial presence. What did you think of the vibant use of tiles in this house?